USED BATTERY RIVETER 4.0MM - 8.0MM with New 14.4v Li-Ion Battery. 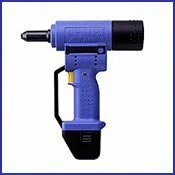 The versatile cableless Riveting Tool for outdoor and indoor aplications. The PowerBird can set all types of standard blind rivets upto 8.0mm and structural blind rivets upto 6.4 diameter in all materials. It can also set upto 7.7mm diameter Bulb-tite in aluminium. High battery autonomy. (Between 150-1000 rivets per charge depenant upon diameter and material. High total stroke of 20 mm. Tool complete with New Li-Ion Battery only.